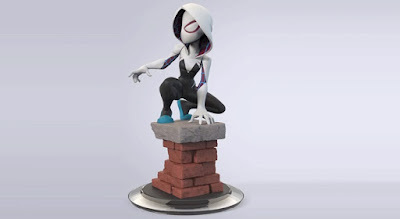 So shortly after the reveal of the cancelled Doctor Strange Disney Infinity figure, we now get news and images of the cancelled Spider-Gwen as well. Once again, I must say this is awful because the game had so much potential that wasn't being capitalized on. As amazing as these figures were, the in game content was severely lacking and is, at least I believe, why the sales weren't nearly as good as Disney was hoping. The situation could be remedied by greatly expanding the in-game content, and- to cut costs- make the figures smaller. An even $9.99 would be considerably better than the typical $15, especially because the figures had a limited number of resets (2), and could only be used in certain play sets. Disney Infinity was very constricted in terms of play and ridiculously limited in scope. But the potential was there. So much potential wasted. I mean really, no online play?!? That is almost a standard in every other game made, so why not here? A part of me hopes another company swoops in and Disney licenses the game out so we might see more Disney Infinity. The odds are extremely slim, but at least if some group handled it like Skylanders or the LEGO Dimensions with much larger open worlds, the game would sell much better. We'll sadly probably never get this wonderful Spider-Gwen for our shelves or game.